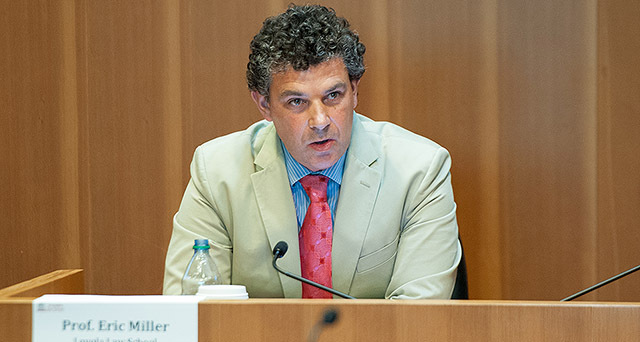 Professor Eric Miller recently presented at the Association of American Law Schools Annual Meeting panel “#BlackLivesMatter: Balancing Security with Dignity in American Policing" raised points that are particularly salient in light of the Chicago report. His talk, published below, which is the basis for his forthcoming law review article in the Fordham Urban Law Journal. A new manifesto of sorts is emerging from certain quarters of the academy challenging us to rethink our parochial approach to criminal justice. The challenge is to detach the way we think about policing from the context of the Fourth and Fifth Amendments, and instead approach policing in the context of some more general questions about the justification of criminal law and criminal punishment. This manifesto of sorts is being worked out by a loose collection of Anglo-American scholars, who have revived the long-dormant political question of how to justify the police within the apparatus of state punishment. That question last made a major appearance in the American legal academy in the 1960s, when Herbert Packer raised it as part of his book on the Limits of the Criminal Law. But it was soon drowned out by doctrinal and sociological approaches to policing. The Black Lives Matters movement has also raised a series of political questions that have lain dormant for about half-a-century: indeed, since the last major period of racial unrest in the 1960s. Some of those questions are: what are the police? What is their role? To whom are they accountable? Whom do they represent? In the late 1960s and early 1970s a variety of sociologists and administrative law theorists including Jerome Skolnick, James Q. Wilson, Egon Bittner, William Ker Muir and Kenneth Culp Davis provided what has seemed like a definitive answer: that the police are those people entrusted with the situational power to deploy force in the community. But the Black Lives Matter movement, along with the less organized but equally compelling smartphone scrutiny of police violence, has given use good reason to be unhappy with this answer. The situational power to deploy force does not appear to represent the rule of law and the rights of civilians on the street. So the sociologist’s answer, telling us what, descriptively, the police actually do, does not tell us whether, normatively, the police ought to be doing it, and, politically, on behalf of whom they do it. The political and normative set of questions raised by the Black Lives Matters movement I am particularly interested in, are the questions of representation and agency: on whose behalf to the police act? Police legitimacy often depends upon the answers to these questions: they gain their authority to intervene, including to deploy force, because of their role as state or municipal agents. In acting as the police, they act in their role as public officials authorized by the laws of the relevant jurisdiction that confer the legal power to act as they do. As Michelle Dempsey makes clear, the point is a conceptual one: without a state or a municipality to represent as publicly authorized officials, they would not be police. When, for example, the Mafia takes over the role of ensuring public order in the communities they control, they do not become “the police,” because they represent the Mafia, rather than the state. The Mafia, like the police, often claim to act on behalf of, not only the state or municipality, but also the community. Indeed, the whole community policing movement gains its resonance from that claim. But what does it mean to “act on behalf of” a community? Because it is possible for the state, and thus for state officials, to fail to serve the communities they are supposed to govern. Your country is founded on just such a claim. Are the police an institution that, by its very nature, represents the community in addition to the state? In our current political climate, the question of whom the state represents is a live one: large chunks of people on the right of the political spectrum have claimed that President Obama does not represent them, and large chunks of people on the left of the political spectrum claim that President-Elect Trump does not represent them, either. These communities are making an important political point: to represent some group is to claim to be authorized by that group to speak and act on its behalf. The police have a pretty compelling claim to speak and act on behalf of the state: they are members of the executive branch of government, and the various constitutive rules of government identify them as state agents. But speaking on behalf of the community is a question of political rather than institutional legitimacy. And it is that question that is being pressed by the Black Lives Matter movement, and requires a political answer that goes beyond the constitutive rules of the state. One political answer is that acting on behalf of a community—representing a community by speaking on its behalf and acting in its name—requires regarding oneself as answerable to the community. It requires regarding community members as having standing to call you to account, as a community representative, for what you are saying and what you are doing. And this idea of accountability has important consequences for the political standing of members of the public on the street, in their interactions with the police. The police provide two answers to the question of how they are answerable to the community: the first is that they express the values and interests of a particular group, for example by soliciting public opinion and input as to how to deploy their resources. This is the answer promoted through the community policing movement: the police are not mere agents of the state, but responsive to the needs of the community. We have good reason to be suspicious of that answer. As my colleague, Priscilla Ocen argued yesterday, the history of policing is of denying that black people, and especially black families, share values deserving of police protection. Instead, the tenor of policing has been to remain suspicious of supposedly pathological black values. And as the Black Lives Matter movement reminds us, this normative suspicion has practical consequences, as the police live outside the community and treat the communities they police as outsiders or enemies to be quelled rather than answered to. But the sociologists revealed another answer, one that often exists alongside of, or instead of, the community policing answer: the police are answerable to some secret or inarticulable public desire for order at any costs. Call this the dirty hands model of policing, exemplified by the fictional San Francisco detective Harry Callahan in the movie Dirty Harry. For Callahan, the community-responsive requirements of public order justified ignoring the law, the Warren Court’s recent constitutionalization of policing, and his superior’s constraining administrative directives. The police, Callahan believed, answer—perhaps like all public officials—to a separate morality. In the role of a cooler, more romantic Machiavelli—who introduced or at least popularized the dirty hands idea—serving the community often means, for Dirty Harry, acting against the community’s express moral norms. Acting on behalf of the community means acting on a separate code, one that renders him unaccountable to the state and to the public. This claim to criminological expertise and political necessity has wide political currency in our culture and in policing. But a feature of dirty hands policing on the street is to *exclude* people from the community, and treat them has having less standing than the cops to determine what is right and wrong. The cops become Platonic guardians of the community, but guardians whose role conflicts with the normative and political claims of the state to serve the people on behalf of whom it act. It is a vision of policing that undermines the ability of the public on the street to question and challenge police authority, and so undermines the political equality of the public and the public officials who act on our behalf. This view of the police as an unelected blue-collar aristocracy whose deeds escape the normal categories of morality and political accountability was a particular concern of the Warren Court. The foundational contemporary criminal procedure case, Mapp v. Ohio, asserted “the right to be secure against rude invasions of privacy by state officers…can no longer…be revocable at the whim of any police officer who, in the name of law enforcement itself, chooses to suspend its enjoyment.” The point of constitutionalizing criminal procedure was, according to Justice Clark, precisely to render the police answerable to the community as a coequal member of that community, rather than some Platonic Guardian of the laws. The Mapp court called this Dirty Harry style policing “lawless.” And lawless policing presents a additional type of danger for the police: a moral danger. Too often, we emphasize physical danger and overlook the moral dangers that police face. But we should remind ourselves that moral danger played a part in the early sociological discussions of the police, in two ways. For Jerome Skolnick, policing produced an inherent moral conflict between the demands of rule of law and those of public order, because enforcing public order was taken by the police to mean the ability to ignore the law. And William Muir pointed to one outcome of that conflict: the erosion of the officer’s moral standards so that police officer becomes cynical as to motivations or moral standing of other individuals. We should become more attuned to the ways in which the demands we place on the police place them in moral danger. And one way to do so is to hold them, and ourselves, accountable to ordinary moral standards when thinking about policing. But that requires us to see ourselves as part of the community that is policed, instead of separate from and antagonistic to it. To recognize, in short, that Black Lives Matter. Dollree Mapp, who is perhaps a prototypical Black Lives Matter activist, is our prototypical public citizen in this respect. In resisting the police, she asserted her full citizenship and equal standing through her right to challenge the police, and force them to account for themselves as acting on behalf of the state: to point to the law to justify intervening in her business. And she revealed that, if the police cannot provide such justifications—if they cannot point to the law as authorizing their actions they are officers in name only. Normatively and politically, they are, like the Mafia, answerable to some different set of standards. The harder question is whether they act as agents of the community and of the state. And that, in part, depends on the response of community members and the state to police wrongdoing. Because the choice is a stark one: for the state, and for us, to endorse Dollree Mapp's assertion of equal citizenship; or for us, and for the state, to reject her and create a fragmented community organized around two classes of citizenship subject to differential treatment through the police. Recognizing that we cannot but be on the hook for our answer to that question is perhaps the most profound lesson of the Black Lives Matter movement. Aaron H. Caplan, Free Speech and Civil Harassment, Hastings L. J.
Priscilla Ocen, Punishing Pregnancy: Race, Incarceration, and the Shackling of Pregnant Prisoners, Cal. L. Rev. Yxta Maya Murray, 'Creating New Categories': Anglo-American Radical Feminism's Constitutionalism in the Streets, Hastings Race & Poverty L. J.
Lee Petherbridge (with Jason Rantanen), The Pseudo-Elimination of Best Mode: Worst Possible Choice?, UCLA L. Rev. Disc. Lauren E. Willis, When Nudges Fail: Slippery Defaults, U. Chicago L. Rev. Seagull Haiyan Song, How Should China Respond to Online Piracy of Live Sports Telecasts? A Comparative Study of Chinese Copyright Legislation to U.S. and European Legislation, U. Denv. Sports & Ent. L. J.